We have no doubt come a long way in how we treat our outdoor garden spaces as extensions of our homes, fulfilling a need to sit outside and enjoy the sun in a cool and comfortable space. In years past, outdoor rooms often were nothing more than a covered area at the back of the house with no visible connection to the spaces within the house. They were not very inviting, and were more or less an empty space lacking character and real function. But today many designers treat these outdoor garden spaces as they would a room within the house, providing outdoor area in which to sit, reflect and entertain. All aspects of interior design are merely translated to the outside, with alternative materials that withstand the elements with style. Here are some examples to get your creativity flowing. 1. A room above the treetops. You don’t have to know too much about this home to establish that it sits high above the treetops. The views are sensational not only of the landscape but also of the city (out of shot). And what better way to enjoy them than to sit under a pergola where the ground beneath appears to float? In this outdoor room, you don’t want to feel a sense of containment, but a sense of belonging to the landscape, so you can enjoy the outdoor elements. 2. 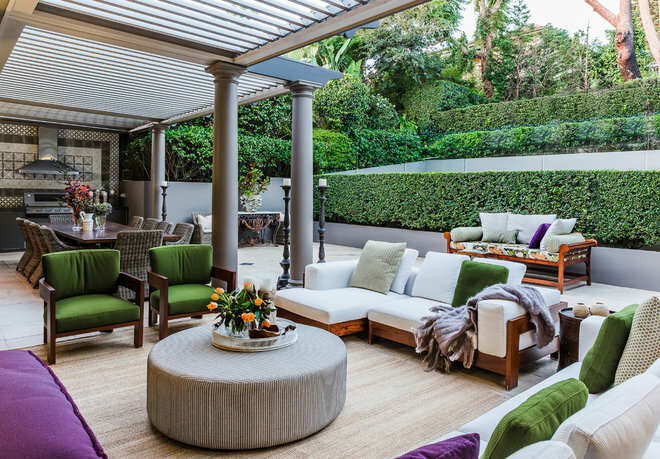 A theatrical outdoor room.Above a sunken courtyard sits this outdoor room with a great sense of drama. Originally intended as a carport, it’s also used as an outdoor stage and family area. Access is from a side bridge. There is no roof but a series of walls with mood lighting, a soft curtain at the rear and bifold doors. 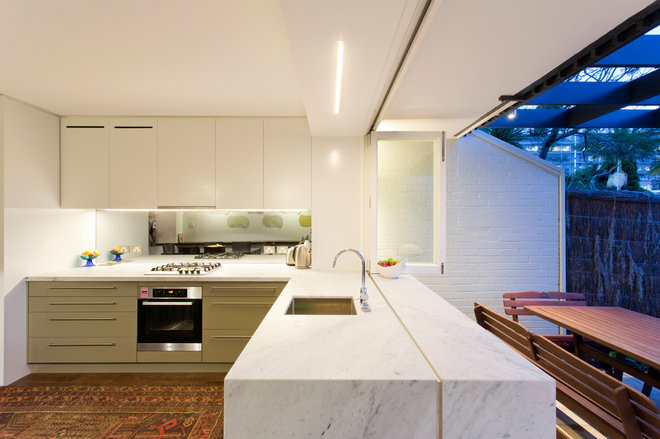 Here the focus is not on the green garden but the functionality of the hard-edged space. 3. The trellis effect. The architects of this contemporary porch have designed an outdoor room that has a sense of enclosure while maintaining a relationship with the outside. 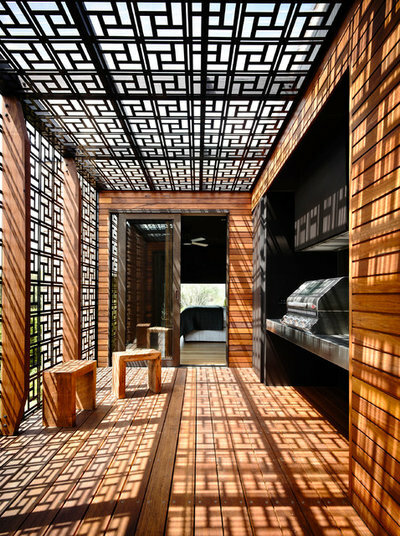 Laser-cut screens both block and allow sun to penetrate, creating geometric shadows. The space is minimal while also being rich in material. 4. Mother Nature’s bedroom.The designers at Compagnie Dhave translated interior elements to the outdoors to create this peaceful retreat at the back corner of a garden. 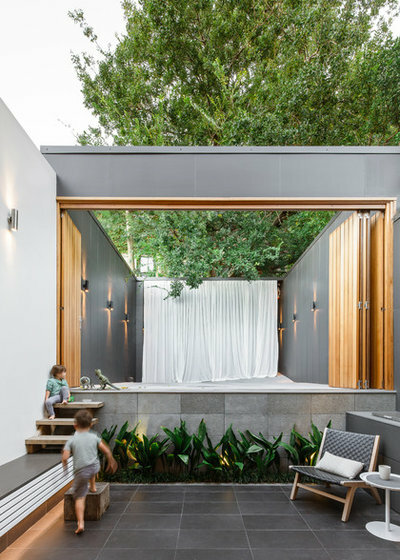 There’s a sense of enclosure: The tree canopy acts as the ceiling, theperimeter fences as the walls, and the lattice detail as textural wallpaper. The analogy doesn’t stop there. The decorative dishes sit on the wall like picture frames, and bird cages and lanterns in the trees act as pendant lighting. The soft, lush plants are Mother Nature’s carpet, leading to the daybed, a place of respite and rest. It’s an organic outdoor room for anyone’s garden. 5. A hole in the wall. Sometimes you want that outdoor garden room but you’re not prepared to create a space in its own right. Like opening a window to the outside to allow a cool breeze to enter, or to hear the sounds of birds singing in the trees, architect Angus Mackenziecreated a hole in the wall of this home, where a series of sliding doors open to reveal the optimum indoor-outdoor seating spot. When weather permits, you can enjoy all the elements that Mother Nature provides and when such occasions require the closing of the glass doors, this window seat becomes a cosy interior corner in which to sit and view the world outside. 7. The outdoor kitchen. 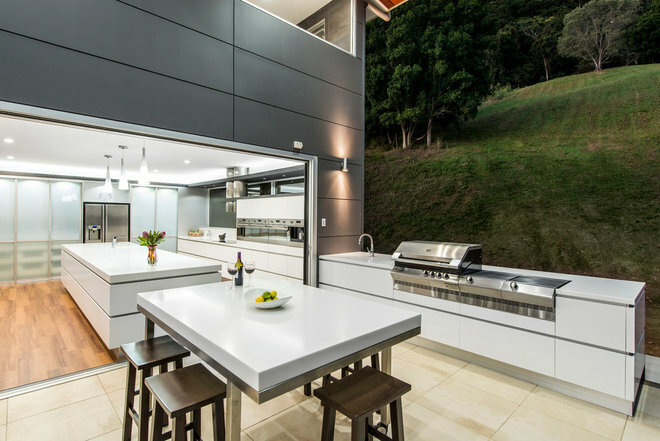 This creative outdoor experience literally extends the inside to the outside, mimicking the white and stainless steel materials found in the kitchen within to create an outside room that would be welcome in any home. With the back wall of the house open to the outside, the two kitchens appear as one. The durable stone countertops of the internal kitchen are used outside and the traditional stainless steel oven and cooktop appliances are replicated with outdoor appliances in the form of a barbecue and side burners. Even the cabinetry of the outdoor kitchen takes its design cue from the kitchen cabinets within. What makes this outdoor kitchen-dining area work so well is the integration of all the design components that work well together. The proportions and site lines are carried through from inside to outside and appear seamless. 8. The outdoor bathroom. The designers at Dean Herald-Rolling Stone Landscapes set out to create an intimate hideaway — a bathroom that brings privacy and luxury outdoors, surrounded by lush landscaping. Rather than do without the more traditional fixtures and fittings, they have been reinterpreted. The enamel bath tub has been replaced with an oval-shaped stone vessel; water cascades from a stone-covered wall waterfall feature; a mirror-paneled ledge reflects the surrounding garden; and a shower head sits to the side mimicking rain from the sky. Soft lighting and the experience of feeling enclosed while being open to the sky with its bright-lit stars at night creates an ambiance of pure luxury. 9. The invisible room. 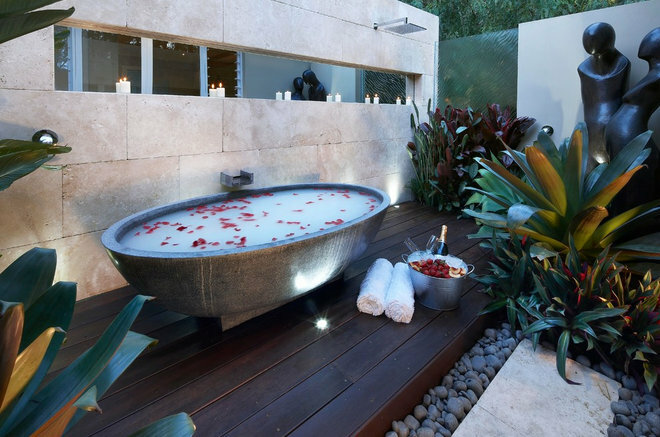 Creating an outdoor bathroom whereby its use is limited by the weather may not be everyone’s idea of a practical outdoor room. Instead, fling open those double doors and open up an entire wall to your garden. 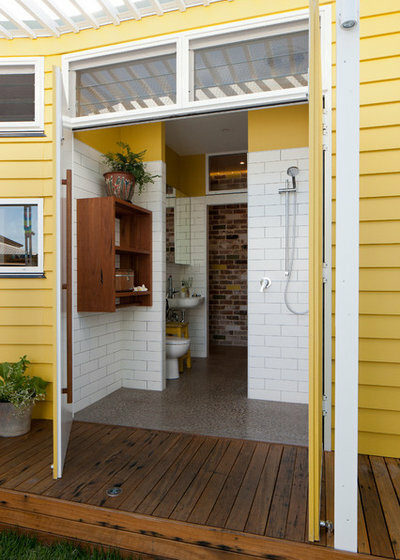 Here Studio 74 has created an outdoor porch that allows direct access to the bathroom inside. 10. The outdoor dining room. This outdoor alfresco dining room celebrates all the attributes provided by a landscaped garden while embracing a sense of enclosure and protection from the weather. To create a sense of intimacy, walls are defined by their function. On one wall, an outdoor kitchen and built-in fireplace provides all the internal comforts outside, undercover and protected from the elements. On the other wall, built-in seating set amid a lush garden allows for respite to take in those rays of sun on a crisp spring morning. Out of shot, the space opens into the home via bifold doors. The roof appears to hover, supported by minimal supports. The design philosophy here is not to completely enclose the space but to capture garden and outdoor glimpses. 11. The inside-outside experience. 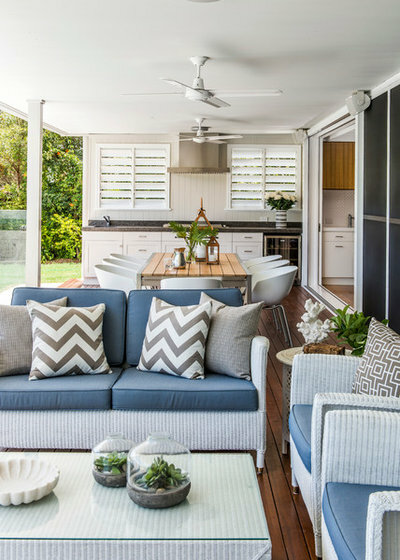 Creating an outdoor room or experiencing the feeling of being outdoors does not always mean styling an entire alfresco area as seen in previous photos. 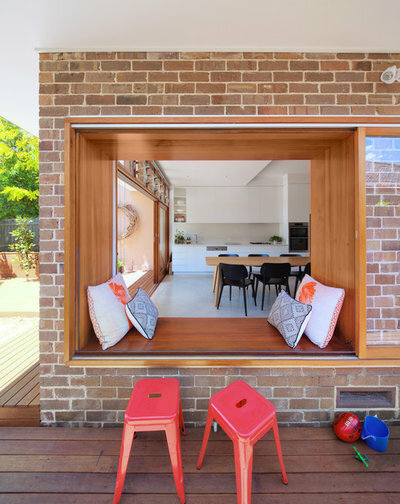 Why not, instead, open up the back of your home and utilize the internal functions such as the kitchen to enjoy outside with all the comforts of the inside.Danny Broe Architects has created this simple concept by providing bifold doors that slide to the side to open up the space. 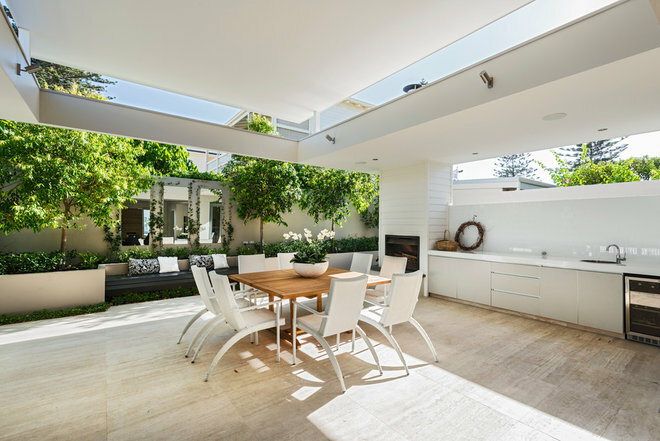 What makes the space more interesting is that the bifold doors cut through the central island kitchen bench, provide a permanent serving area and under-counter storage for the outdoor dining area. 12. The garden pavilion. If your garden is large enough, why not create stand-alone garden pavilions where overhead canopies provide cover and the walls are open to the surrounding garden. This terraced garden provides individual outdoor rooms like those found within your home. The lower level houses a kitchen that can act as both a food preparation area and a bar for pool guests floating by. On the higher terrace, the undercover dining experience is set among the lush green landscape where the highlight is a floating dining counter. 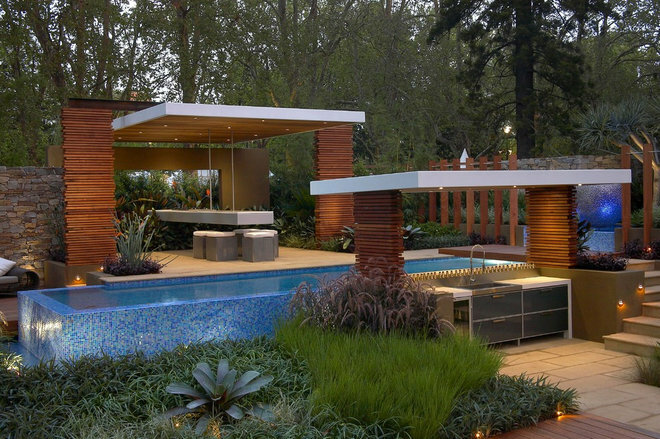 Layering the garden using natural durable materials helps define the spaces. 13. The outdoor terrace. Living in the city doesn’t have to mean missing out on a great outdoor room. Even if you lack a traditional outdoor space within a garden environment, you can still create your own special view. 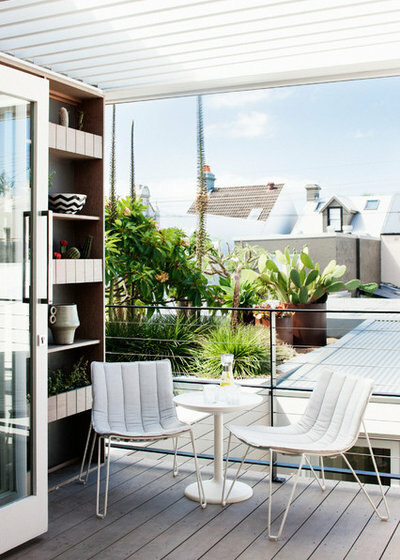 In this Sydney, Australia, terrace, interior designers at Baxter Creative have utilized the smallest of spaces to accommodate a couple of chairs and a drinks table — and have even managed to fit in a stylish bookcase. Here, being on the first floor has its advantages. Views extend out to the rooftops of adjoining homes and a lush rooftop garden opposite, created to provide an enticing outlook to the terrace balcony. 14. The secluded outdoor room (on a sloping site). A sloping site can sometimes provide the most difficult terrain for creating an outdoor room. However, a negative can sometimes become a positive. Intimate and private outdoor spaces hidden from adjoining neighbors can be created by terracing your garden. This provides not only flat usable spaces but an opportunity to create different rooms at different levels, each camouflaged and defined by manicured garden hedges, as seen in this home. It’s a lush and private outdoor room contained within the walls of a garden. 15. A room with a vista. An outdoor room can be a place for reflection and simply taking in the sights. 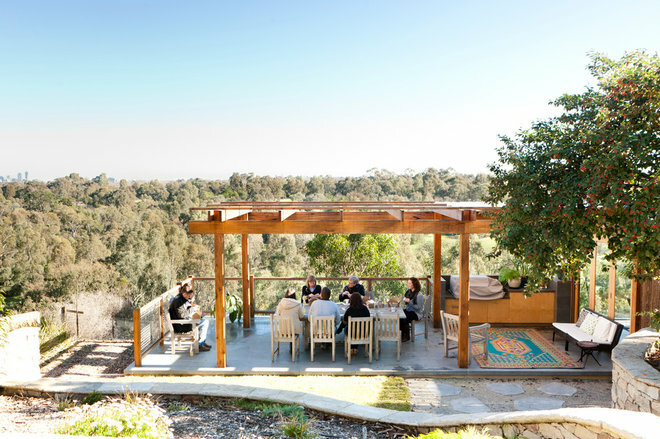 This Sydney house has a wonderful layered outdoor room where, from the dining suite, one can look out to the garden, which is beautifully framed by a climbing vine. From here there is a view of the pool and then the waterway and finally the hilltop homes. 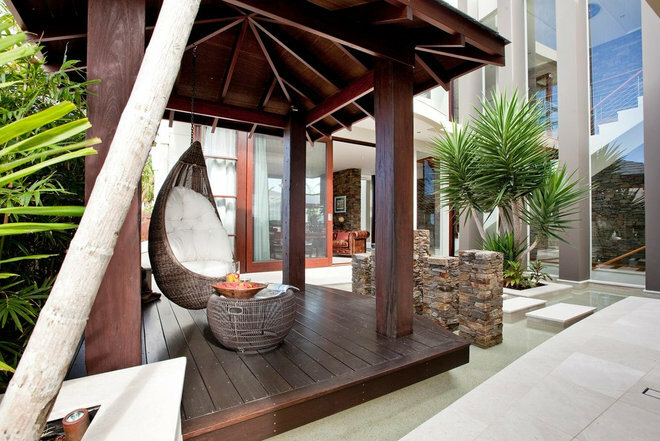 This outdoor room is not complicated and nor does it have to be. It’s the surrounding spaces that create the atmosphere in this courtyard — no additional embellishment needed. Simplicity is the key. 16. A floating space for one. There is something magical about feeling like you are floating on a boat or suspended in midair. This outdoor space has all those ingredients — a raft that appears to float on water, and a space for one, where a suspended wicker chair accentuates that feeling of being cocooned. A faraway island set among an urban environment. 17. The meandering outdoor room. This private garden in Sydney’s south is a vast meandering outdoor room where different pockets are created to enjoy the garden itself and the views of the water beyond. It’s not a space defined by four walls or a purpose-built deck with a roof or a space connected to the house. It’s a free-flowing space where discovery and enjoyment of the individual spaces is paramount. 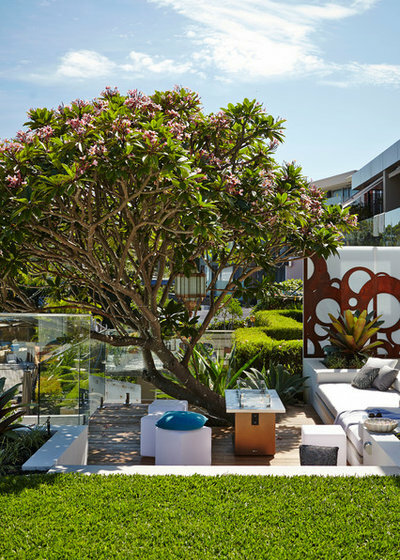 A richness of material is provided via the outdoor styling and the selection of sculptures and plants. This garden provides not one room but an array of outdoor rooms. 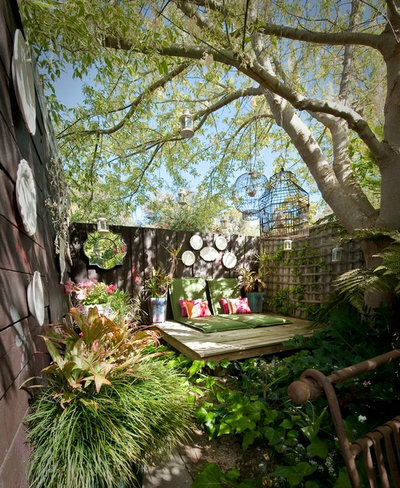 Tell us: Do you have a garden space that acts as an outdoor room? Attach a photo or share your thoughts in the Comments.